Today for my Sunday Selfie I'm getting in the Christmas spirit with my cute pink Santa hat. How do I look? I also want to introduce you to a little cutie pie who showed up in our Facebook feed last weekend. 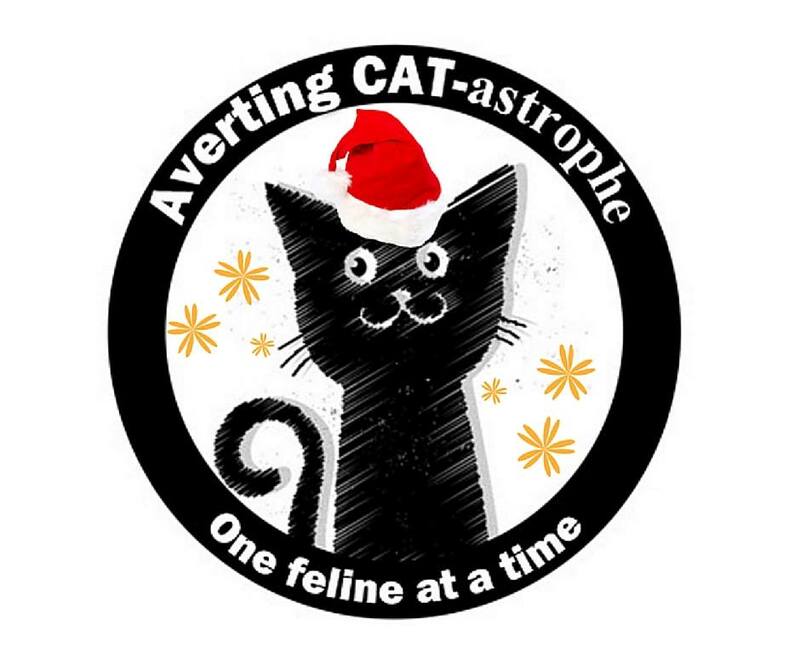 He was rescued by an all-volunteer group in the DFW area called Averting CAT-astrophe after being abandoned by his mom, landed safely in foster care and needed sponsorship to pay for his vetting once he's ready for his forever home. I asked Mommy if we could donate some money to help get the sweet tot get back on his paws. After all, isn't the true spirit of the season the act of giving, caring, and compassion for others? We hope that in a very small way we helped him start a purr-fect new life. Just look at this precious baby! We are strong supporters of AvertingCATstrophe and were lucky enough to meet Cori and her kitty Sebastian at BloPaws.This is a loving and lovely rescue we are proud and happy to help by bidding in their auctions. You are so kind to to support them, thank you. Stunning selfie, Mudpie. We especially like that lighter patch on/next to your nose. A true beauty! 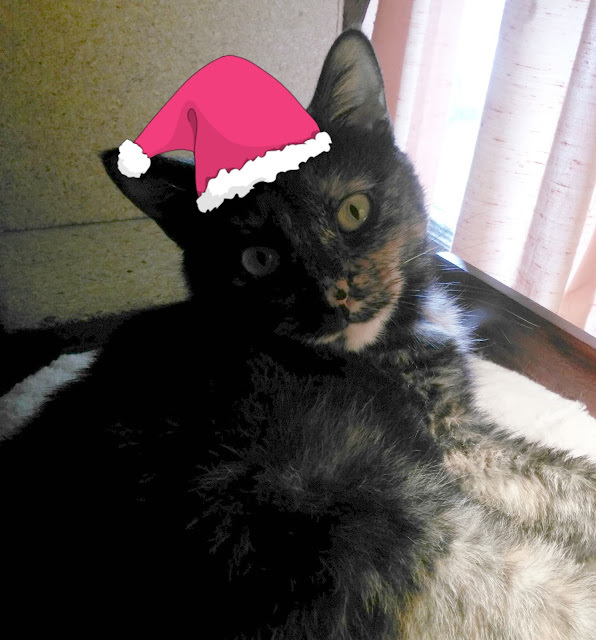 You made me want a pink Santa hat, Mudpie! What a little cutie that got rescued! You look so cute in that hat, Mudpie, and I'm glad you and your mommy got to help out another kitty in need! You are precious, Mudpie, and so is the rescued baby you helped. Mudpie, you look so adorable and festive. I'm glad that kitten was rescued and sure do hope he's adopted soon! You look very festive and please let us thank you for rescuing that kitten. How do you look, Mudpie? ADORABLE! And it is so wonderful that you and your mommy helped that little kitty. I hope you don't mind sharing the title, Mudpie, but that little kitty sure is adorable, too! Mudpie you look as adorable as ever~! So nice that you and your mom helped that kitty! Clearly you are filled with the holiday spirit! Adorable selfie. You and your Mom are very kind to help that poor kitty. Love your hat. Very festive. You look very cute in your Santa hat. The little rescued baby is very sweet. Mudpie, your selfie is ridiculously cute! I just love your sweet pose. You and your mommy are so kind to help that little one. I have a blanket just like that too. Mee-you Mudpie pink iss definitelee YUR color!!! Yur beeuteefull. Wee are glad hee iss safe an are so happy you could make a doe-nayshun!! Yur both so-o PAWSUM. 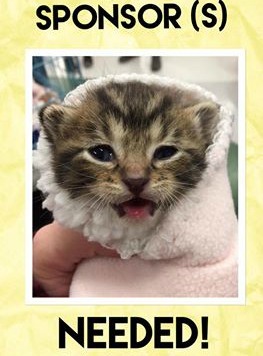 Mudpie you are so cute in your Santa hat and what a sweetie pie that purrito wrapped kitten is, we think that baby is well on it's way to finding a loving and forever home. Love that pink on you, sweet Mudpie. And I love your giving heart. How wonderful to help a little kitten in need. That is the true spirit of the season! You look cute and festive Mudpie ! Purrs for helping the tiny kitty too. You look adorable as well as festive, Mudpie! We bet that little cutie pie kitty will find a home in no time. It was really nice of you to help out that cutie pie. You look cat-abulous, Mudpie! And how awesome of your Mommy to help that little one!